Could Gamasutra Job Posting Hint At inFAMOUS 2 Multiplayer? | The Gamesmen- What role will YOU play? 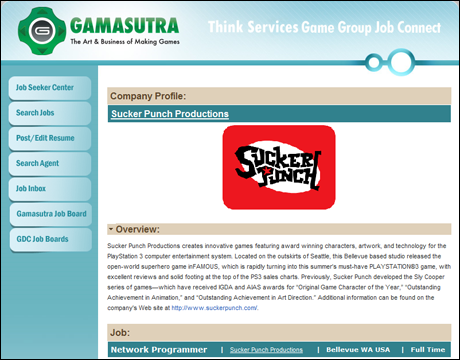 »Rumor»Could Gamasutra Job Posting Hint At inFAMOUS 2 Multiplayer? Could Gamasutra Job Posting Hint At inFAMOUS 2 Multiplayer? A job posting on Gamasutra.com, whose tagline is “The Art & Business of Making Videogames” and concentrates more on the personnel and technique side of gaming, may shed some light on things to come. The want ad, posted by Sucker Punch Studios, is for an industry professional with “3+ years commercial programming experience” and the position would be “to implement the on-line component for our forthcoming AAA title“. The only franchises Sucker Punch is known for other than inFAMOUS would be the early Rocket: Robot on Wheels game and the Sly Cooper series, which we’ve heard nothing of to this point. So this begs the question- could inFAMOUS 2, which is all but confirmed at this point, feature competitive multiplayer, co-operative, or both? Click the link below for the full posting.